Invitations Extension helps to increase number of your store customers who can easily invite their friends. You can reward both - invitee and invited customer with a discount, therefore increase your sales! Invite friends by socially liking the page. Provide a discount coupon while sending an invitation. Website admin can manage customer invitations and modify referral link. This Magento refer a friend extension allows your clients to invite their friends in a convenient way. Users can import contacts from Yahoo, Gmail, MSN (Microsoft Outlook, Hotmail, Live), Mail.ru and social media services and invite their friends in bulk. With this extension, site owners can create a promotional page to boost membership registrations by running special promotions. Additionally admin can manage all customer invitations and address books from Magento backend. 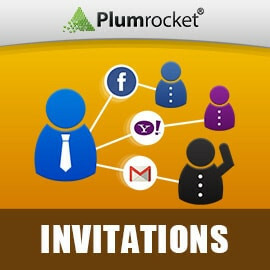 If you've been looking for a fast and convenient way of inviting friends to your membership store, the Invitations Magento Extension from Plumrocket will undoubtedly be a great surprise for you. There is no need to waste your time and efforts copying your address book for hours on end. Now, you can just import all your contacts: import address book, import Facebook contacts, import from gmail and Yahoo and other social media platforms. Invite your friends with just one click! If combined with the Magento Reward Points Extension, the Invitations module allows customers to earn rewards when they refer a friend who makes their first purchase. Both Reward Points and Invitation extensions are also available as part of Loyalty Program Package. I purchased several extensions from Plumrocket, this being one of them and pair with reward points extension. It is easy to integrate with my Porto theme and work perfectly. Muy buena para obtener nuevos clientes. We love this extension! It's a great extension to increase your customer base. Anytime you can motivate your existing customers to bring business to your site is a plus. We use this along with the Plumrocket Rewards Points extension, and it's a good combo. Plumrocket tech team is A+, highly proficient coders, with smooth deployments and good communication. Also, it was easy to configure and adjust to fit our websites design. Extension works out of the box. A few translations was needed + CSS fixes. Absolutely the most unique extension of its kind. Perfect for audience where social media is used often . Great to create the buzz and grow store to critical mass virally. There's a lot of social sharing extensions out there and they all do pretty much the same thing, but this one had a really nice UI for the user and fully integrates with their loyalty extension, so the bundle worked out great for us. Also, it's a one time buy, so we aren't going to incur the ongoing monthly costs of similar web based services. Call your customers to action! Use this extension to let you Customers invite friends in a lot of different ways. Hi, we bought this extension a couple of days ago. Very high quality support, works as described. I have nothing bad to say. Very happy with my purchase. Helps us spread the word! We have seen an increase in traffic because of this extension. Great for viral growth. Improved default magento feature "Email to a Friend" on product pages. Now "invitation url" will be added automatically if according option "Allow invitations from all website urls" (in back-end) is set to "Yes"
Fixed bug with custom referral links. Fixed bug with metadata on Promo Page. Added ability to set limitation for the amount of email invitations sent to prevent sender from blocking. Fixed issue importing some contacts from Address Book. Added new functionality for guest visitors to invite their friends from promo page. If guest user registers an account, all his referals will be transferred as well. Invitation email subject and body template are now moved to magento back-end. Fixed bug that restricted number of imported contacts from Yahoo Address Books. Added Yahoo contacts import via new Yahoo API. Promo page fix related to plumrocket popup login extension. Added new option in extension config file - "Allow invitations from all website URLs". This option allows to convert any page of your store into "invitation link", which leads to a lot higher invitation rates, site traffic and customer satisfaction. New option added allowing to set Minimum Order Subtotal and Maximum days after registration for an invitee to make a purchase.